For this month's "Maps of the Month" featurette, I wish to draw your attention to JonLeung's Metroid Dread (DS) maps. When the Galactic Federation encounters Space Pirates mining for lost Chozo artifacts, they call on bounty hunter Samus Aran to investigate. Samus travels deep into the planet Ilpstra I, stopping the Space Pirates from uncovering anything dangerous. Like in any Metroid adventure, she collects many artifacts and tools along the way. Here, she ultimately dons the long-lost Final Suit and battles a mechanical statue, Kaiser Ridley, also equipped with the Final Suit, in a showdown that (unsurprisingly) leads to the destruction of the planet - but at least the galaxy is safe again (at least until the next Metroid game). The DS's touch screen adds a new element to the familiar 2D Metroid gameplay - the Scan Visor from the Prime series returns here, and assists in first-person segments which you interact with using the stylus (such as shooting Seeker Missile door targets and soldering broken circuits with the Plasma Beam). Now, how will you make your way through the tunnels of the planet? And find all the equipment? And escape in time? That's where these maps come in handy. Every room and every item is laid out for your perusal. Kaiser Ridley doesn't stand a chance! 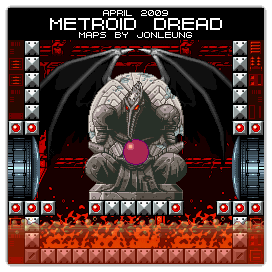 So to recognize the effort put into mapping the latest 2D Metroid adventure, JonLeung's Metroid Dread maps will be known as VGMaps.com's Maps of the Month for April FOOLS' 2009. The designs are absolutely fantastic. The detail is very nice. It looks like we'll be talking about this one for a while, although I've had very little experience in playing any Metroid games. Ah! These maps are just thing I need. I've been stuck quite a while after getting the Gravity Suit. I absolutely love the complexity of Metroid maps, with all their winding passageways, secret tunnels, and destructable walls. I kind of wish I didn't spoil so many of the secrets for myself, though. I'm only near the beginning since classwork and mapping is taking up all my time. when did this game come out?? 1st April 2007 I think. Oh yeah, this game. Let me tell you, the newest Metroid game is always the best, but it'll be _really_ hard to top this baby. I just beat it today. Kaiser Ridley was a pain in the rear end to defeat. I was so happy when these maps were put up. If it weren't for these maps, I would still be lost in Geodys. Next year you've got to do a 16-bit Mega Man X9! I can't find this game anywhere....can you lend me your copy Jon? I just bought a new DSi and I wanna try it out. The map design is really, really awesome. Great job. Absolutely smashing. Yep, HAPPY APRIL FOOLS' DAY! Thanks, guys, for your comments and the like. Maybe I'll maintain interest in this by writing up a "Making Of Metroid Dread" thing which I could post in a few days, which will shed light on a few things, like the rundown of the process and maybe mentioning some of the things I really wanted to include. I'll have to be sure to avoid being too lamentative (?) about nitpicky things that you wouldn't have noticed for fear of downplaying the effort, though. I think I'll include some reduced-size animated .GIFs showing the creation of an area from start to finish - good thing I kept a lot of intermediary images. I estimated 250-300 hours went into this over the last four months, nearly every day since the beginning of December. So I am burnt out, but I should write about this undertaking before I forget it all in the midst of catching up on all the other stuff I meant to do during the past few months. So be on the look out for that. Wikipedia, apparently, deleted their individual April Fool's Day articles because they apparently weren't notable (surprise, surprise!). "Whats next, Christmas 2006?" Pah. And even though these maps are fake, they're also really cool! Just like last year's Oracle of Hours maps, they're all completely "playable" from touchdown on Ilpstra 1 to Kaiser Ridley battle. A lot more effort probably went into these, though, seeing as this year was 24 bits higher in terms of graphics depth.